GEWO Balsa Carbon 575 is a controlled, well-balanced OFF- blade. Ideal for spin-oriented, direct, close-to-the-table attacking. High forgiveness on "off-centre" topspin hits. 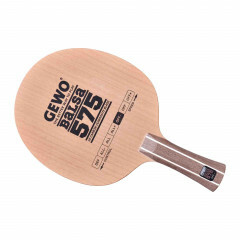 GEWO Balsa Carbon 575 is just perfect for players relying on powerful, high-precision ALL/ OFF playing. Thanks to the 5.75 mm thick, vertically cut balsa centre ply, your offensive strokes will have just enough speed at full control. Precise and well-placed attacks, high-speed topspin rallies as well as all passive strokes come easy with GEWO Balsa Carbon 575. Ultimate "feel-good" blade thanks to the combination of soft balsa material and premium 1K-Carbon: For all players relying on powerful and controlled attacking. Gewo Blade Balsa Carbon 575 is beeing added to cart.